...with our free ebook, "Electronic Health Records Software: A Vital Component to Any Modern Medical Practice." EHR software is vital to the success of any medical network, group, or practice. Our guide highlights essential things you need to know about EHR software. 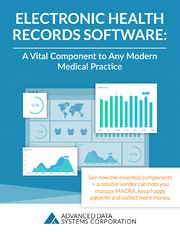 Fill out the form on this page to download your free copy instantly, and discover how the essential components and a reliable EHR system can help you manage MACRA, keep patients happy, and collect more money for your medical practice.